Life as a Vanderbilt student has its ups, downs, and everything in between. From forming lasting connections with new friends to staying up all night finishing that essay or studying for an exam, starting college is a whirlwind. We here at My Commons Life are right here with you, and we believe that no one quite understands this sort of excitement and anxiety like Regional Manager Michael Scott of The Office (if you don’t recognize the name, you’re missing out big-time). 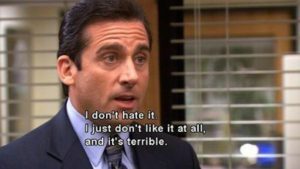 Here are 5 times that Michael Scott has perfectly captured what it’s like to be a Vandy freshman. 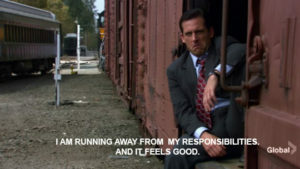 Transitioning from high school to college work is hard. Suddenly, so much more is expected from you, and things can get a little confusing. We don’t know about you guys, but this screams “Common App Essay” to us. Between food, Ubers, going out, and college tuition, this one pretty much speaks for itself. For those of us who have been stuck at Rahnas at 3 A.M. on a Wednesday night, this hits pretty close to home. When the stress gets too crazy, just grab an Ofo and bike away from your responsibilities at the low price of one dollar (See #2)! In all seriousness, though, if you’re ever feeling a little too much pressure, don’t hesitate to make an appointment or connect with the student wellness center! And finally… The words of any Vandy pre-med student talking about General Chemistry. Thanks for reading Commodores, and as always, Anchor Down!